What’s New with the P90X2 Nutrition Guide and Meal Plan? Everyone wants to know how we went about breaking down the P90X Nutrition Guide and rebuilding it into the P90X2 Nutrition Guide. After all, if it ain’t broke, don’t fix it, right? In a way, that’s true. Just as Steve Austin was a great astronaut before Oscar Goldman and the OSO spent $6 million to turn him into the Bionic Man, the P90X guide is still a great resource. However, you, our customers, have changed. We’ve spent the last 9 years watching you evolve into better, stronger, faster fitness fanatics. Our job was the make sure the guide evolved with you. Our job was to make a bionic nutrition plan. Furthermore, our original customers, after one or more rounds of P90X, with possibly a little INSANITY thrown in for good measure, have become incredibly aware of their nutritional needs. They’ve learned exactly how much protein, carbs, and fat they need to perform. They’ve also started experimenting with various nutritional philosophies. Although I’m neither a vegan nor a primal eater, the sheer volume of questions about each on the Team Beachbody Message Boards has forced me to become an expert on both. So we took these factors, combined them with the latest research, and voilà! 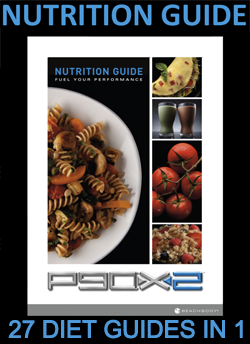 Welcome to the P90X2 Fuel Your Performance Nutrition Guide, a collection of 27 different subplans, among which you’ll hopefully find a way of eating that works for you. In order to offer all this variety, we decided to do away with the menu plan. The vast majority of P90X users preferred the portion plan anyway, so we focused on that. However, everyone loves a good recipe, so we reached out to some of our favorite chefs, including Tony’s personal chef Melissa Costello, and asked them to design a host of meals for every occasion. In this new guide, you’ll find scores of breakfasts, lunches, dinners, soups, salads, and Shakeology recipes. Because we also have grain-free and vegan plans in P90X2, we made sure to have plenty of recipes to suit both of these dietary approaches as well. As was the case with P90X, each recipe lists the portion boxes to check when you eat it. And don’t worry, all your favorite recipes from the P90X Nutrition Guide will still work with P90X2. We also tossed out a lot of the junkier food options featured in the P90X portion lists. At that point, many of you were still transitioning to healthy eating. At this stage, you should have no need for veggie dogs, V8®, or that fast food portion conversion list in the back of the old guide. For every low-quality choice we eliminated from the portion lists, we added two healthy and delicious choices. You’ll find new fats, snacks, proteins, and more. The three calorie “levels”—1,800, 2,400, and 3,000—are still there, as are the different macronutrient balances. However, given that the latest research is making the importance of dietary fat increasingly obvious, we upped the fat in all three “phases.” We’ve also redubbed them “plans,” because while we encouraged you to work your way up the three phases with P90X, by now you should have a pretty good idea what works best for you when it comes to performance, shedding fat, or both. In P90X2, you can just pick the one that works for you and run with it, changing plans whenever you feel like it. That said, if you’re still not sure if you should be eating the “Fat Shredder 2.0” approach, the “Energy Booster 2.0” approach, or the “Endurance Maximizer 2.0” approach, we’ve included a section to help you figure that out. As mentioned above, we’ve also added vegan and grain-free options that work for all three calorie “levels” and all three macronutrient “plans.” If you’re familiar with these lifestyles, you can jump right in. Otherwise, the book includes plenty of information on how to implement them. Also, we acknowledge that some of you cowboys (and cowgirls) don’t like to be restrained by portion lists. You just want to know how many calories or grams of carbs, protein, and fat to eat so that you can use your own foods and measurements. For y’all, we’ve provided charts listing all the numbers you need if you decide to forego the portion plan and just hit the macronutrient numbers on your own. Yee-hah! Finally, we’ve let our top-notch design team rework the guide. They’ve taken a potentially dizzying amount of information and placed it in charts and graphs that should make it easy to digest. A nutrition plan never looked so beautiful. In the 9 years since we launched P90X, we’ve watched umpteen diet fads come and go, each one claiming to be the final word in sports nutrition. It’s absurd, really, considering there’s no one single plan that works for everyone. The P90X2 Fuel Your Performance Nutrition Guide doesn’t claim to do that. Instead, it’s a wide-ranging guide intended to offer you all the tools needed to work with the only nutrition expert in the world who can truly tell you the right way to eat. That nutrition expert? You. Any word on how they’ll incorporate Shakeology? I’m guessing Shakeology once a day, which is what I do anyway. I currently take mine post-workout, but I hear of numerous people having their own preferences. Some do breakfast, some do snacks, and some do dinner. Are you currently on Shakeology? If so, are you getting free shipping? Let me know if not, if you’re a regular Shakeology type of guy, there’s no reason not to save on the shipping. Did you order from Extremely-fit.com? If so, let me know the name on the order, and I can better direct you. If you ordered elsewhere, contact the place you purchased.